When the Rock hosted the Bandits on Saturday night, nobody knew what to expect. Would we see a repeat of each team’s first game of the season when Toronto’s offense didn’t show up and Buffalo played great? 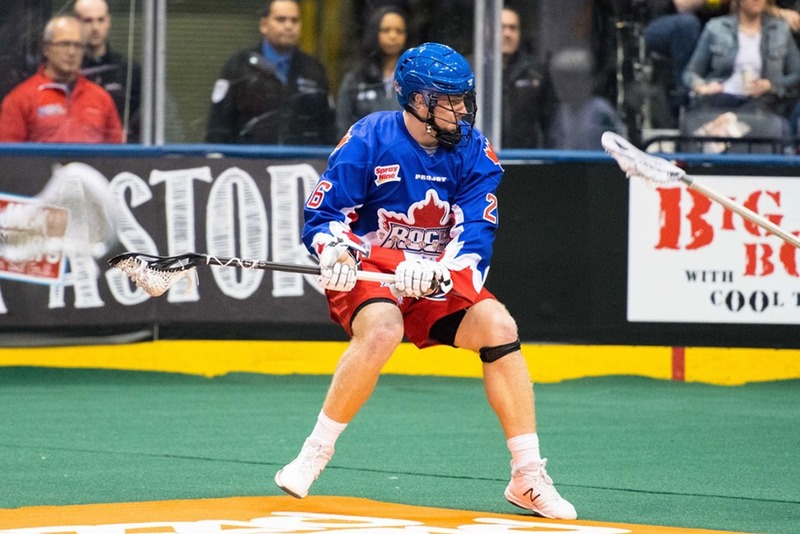 Would Buque rebound from his tough outing against the Knighthawks last week? Would the Rock transition show the improvements that they hoped for with the additions of Challen Rogers and Sheldon Burns? The answers were no, no, and yes. The game started off looking like a repeat of the December 8th game, with the Bandits scoring first and the Rock offense not looking great. Alex Buque looked pretty good as well; in the first quarter, Reid Acton intercepted a Rock pass but before he could get anywhere, Adam Jones stripped the ball from him and spun around with a short breakaway but Buque was up to the task and stoned him. As the game went on, however, Buque didn’t seem to be seeing the ball well at all, and was pulled for the second straight game. This has to concern Bandits fans. With DiRuscio getting hurt last week, Zach Higgins was signed as Buque’s backup. Higgins played all of one game last season, an excellent relief appearance with the Roughnecks, after which he was released and not signed by anyone else. Higgins was a little rusty in this one but wasn’t bad (despite what the final score may indicate) and made a few great stops. As I said above, Toronto’s transition game looked great, with Brodie Merrill looking like Brodie Merrill, Damon Edwards and Challen Rogers playing strong games, and newcomer Sheldon Burns making his presence felt with good defense and lots of LBs. The Rock had three transition goals in the first quarter and another in the second, and a few more opportunities that sometimes led to shots and sometimes not. This was great for Rock fans, make no mistake, but I was still a little concerned. There is no question that secondary and transition scoring are both important, but if Jones, Hellyer, and Hickey are not scoring, there’s still a problem. That problem became less of a problem beginning in the second half of the second quarter as all three, along with Tom Schreiber, began to score. There were still a couple of passes to nobody but there were also some beautiful feeds by all four of them. It really looked like they were starting to gel and turn into the strong (and potentially powerhouse) offense I expected. Tom Schreiber continues to impress me with how hard he works every time he’s on the floor. He scored a goal on Saturday which was damned impressive even if you didn’t realize how impressive it was. He ran around behind the net and as he came forward again, a Bandit defender wrapped his arm around him and managed to pull his helmet off. Schreiber immediately spun around and shot, beating Higgins glove side. It was an amazing goal but even better when you realize that Schreiber, a right-handed shooter, scored this one left-handed. After a slow start to the 2018 season, the Rock looked on Saturday like they have gotten things together. Of course it’s only one game, so we’ll have to see how things look next week in Vancouver. On the other hand, Buffalo had a strong start to their season but have given up 20+ goals in two straight games – and both to eastern rivals. They host the similarly-struggling Calgary Roughnecks next weekend. Drew Belgrave’s first career NLL goal was a beauty. He showed some speed up the floor and scored on a nice shot from a fair distance (though Buque probably should have stopped it). Four minutes later, Dan Craig’s first career NLL goal was even nicer. It was similar to Ryan Lee’s backwards shovel shot from a couple of weeks ago, though from further away. Can’t fault Buque on that one, since he had no way to know it was coming. There is usually a whole section of Bandits fans in the crowd, or at least 5-10 rows gathered together. There were certainly a few Bandits jerseys scattered around the arena but I didn’t see a large collection of them. When Buffalo rookie Josh Byrne scored, the Rock PA guy played “Who Are You”. Adam Jones got Counting Crows’ “Mr. Jones”. Callum Crawford scored a goal from behind the net that looked like it bounced in off of Nick Rose. I didn’t think goals that went in off of the goalie counted but this one did, even after a review. I was unable to find any rule to this effect, so perhaps my understanding is out-of-date. Another review was waved off by the officials. The only reason I could imagine for why they didn’t allow it was because the Bandits didn’t throw the flag within 25 seconds. Good thing too (for the Rock), because it looked like the Rock player’s foot touched the crease.